If you have been visiting, you will notice my lack of posts. I have only been writing on my other site, Imperfect Polish, as time has gotten away from me these days. Recipes can be found there and I promise they are worth the extra click. 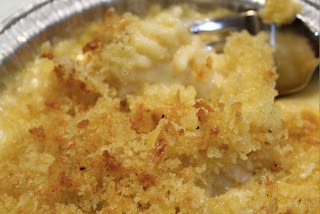 I have tried a lot of macaroni and cheese recipes. They all pretty much taste amazing, but did not have that creaminess that I crave. Really you can only get it from Velveeta, which I refuse to use. Although secretly want to. This recipe is the closest to that uber creaminess I have found and it also allows you to make it ahead. Which is also tricky for mac and cheese. This is not a fancy version, or something that will be the highlight of your elegant dinner party. This is simply delicious, easy recipe that you are going to love. You can serve this in one large greased casserole dish or individual greased ramekins. 1. Heat oven to 375 degrees. melt 2 tablespoons of the butter, add it, along with the olive oil, to the breadcrumbs and stir well. 2. Cook pasta in salted, boiling water 3 minutes less than recommended. You do not want it cooked all the way through. Drain, rinse with cold water to stop cooking and set aside. 3. Combine milk, half and half, and sour cream in a bowl. Season a bit with salt and pepper. Set aside. 4. Melt remaining 6 tablespoons of butter in a large pot or high sided skillet over medium heat. When the butter bubbles, quickly add flour. Whisk well until all the lumps are gone and then cook, stirring frequently, for about 3 minutes. 5. While whisking, slowly pour milk mixture into roux. Add the bay leaves. Continue cooking, stirring and scraping the sides frequently, until thickened, about 15-20 minutes. If it seems that the bottom is burning, turn down the heat. 6. Remove pot from heat and take out the bay leaves. Stir in all the spices and the cheese and combine well. Taste to adjust seasoning. Stir in pasta. 7. Pour mixture into prepared dish(es). Sprinkle with the bread crumbs. **If making ahead, cover and refrigerate to be baked later, up to three days. 8. Bake at 375 degrees until browned on top and bubbling, about 30-40 minutes. Let cool a bit before serving. Another year, another way to make chicken. I wish I had some culinary super break through to share, but really I am just trying to come up with ways to enjoy dinner at home. This chicken could have turned out to be something very forgettable, much like most of the attempts to make a quick chicken dinner at home. But, I was surprised at how flavorful and delicious this was. It was put together from a few recipes I read and I loved the flavor combination of the garlic-y melted cheese, the rich tomatoes and the crunchy crust of chicken skin. With a new year comes even more opportunities for greatness in the kitchen. And although this is a pretty simple one, you can never substitute for good taste. Place chicken breasts on a oven safe baking sheet. Gently pull up the skin and using your fingers, make a pocket between the skin and the breast meat. Fill each pocket with a quarter of the cheese, tomatoes and basil. Pull skin over the filling tightly. Brush entire breasts with olive oil and season generously with salt and pepper. Bake for 40 to 45 minutes, until cooked through. Serve warm and piping hot. Trying think outside of the usual holiday cookie box, I thought I would try one of my favorite treats this week. 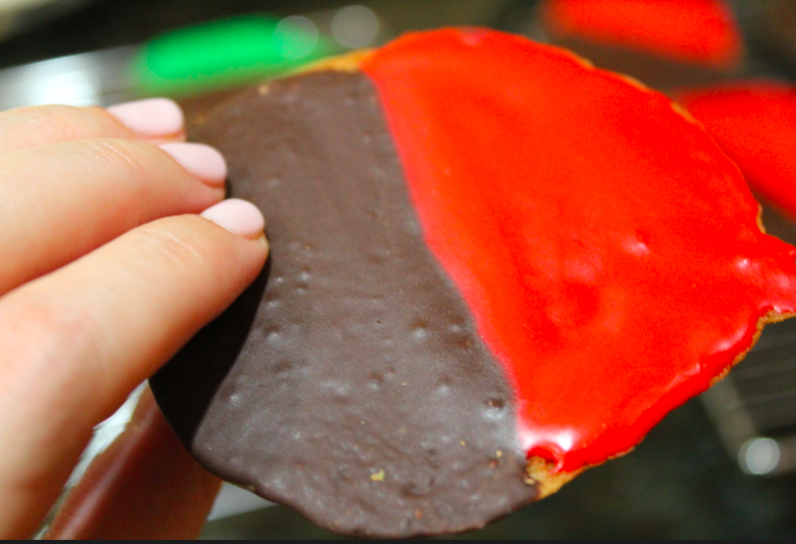 The black and white cookie is a NYC favorite and when done right it is a sweet and cake-like cookie that is perfect for dessert or with your afternoon tea. With a little food paste, I was able to jazz these up for the holidays and the result was not as cute as I would have hoped, but a fun alternative to the usual cut out Santa's and dry gingerbread. Easy to make and decorate, might be a good addition to your cookie tray this week. Beat together butter and sugar in a large bowl with electric mixer until pale and fluffy, about 3 minutes, then add egg, beating until combined well. Mix in flour mixture and buttermilk mixture alternately in batches at low speed (scraping down sides of bowl occasionally), beginning and ending with flour mixture. Mix until smooth. Spoon 1/4 cups of batter 2 inches apart onto a buttered large baking sheet. Tap down the batter to flatten the tops. Bake in middle of oven until tops are puffed and pale golden, and cookies spring back when touched, 15 to 17 minutes. Transfer with a metal spatula to a rack and cool completely. Meanwhile, stir together confectioners sugar, corn syrup, lemon juice, vanilla, and 1 tablespoon water in a small bowl until smooth. Transfer half of the icing to another bowl and stir in the coca, adding more water, 1/2 teaspoon at a time, to thin to same consistency as white icing. **If making festive: divide rest of white icing in two bowls. Add red and green food paste or coloring to desired color. Once cookies are completely cool, turn cookies flat sides up, then spread the colored icing on half of each and chocolate over the other half. 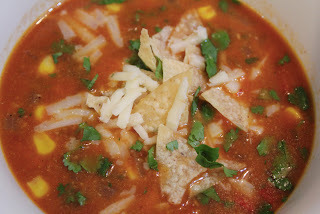 I know, I have posted a lot of Mexican style soups to this blog. But I swear this one is different. I came up with the recipe after reading a few variations and the result was so full of flavor and different from traditional tortilla soups, that I had to share. The broth has a ton of body and bold flavor. And let's get serious, the meatball is having a moment and this soup let's it shine. With holiday cooking and snow on the way, this soup works perfect for nights in when you could use a break from the usual rich and sugary fare. And though it packs some nutritional punch, it feels decadent and satisfying. Just the way I like my soup. Heat oven to 350 degrees. Combine all the ingredients, except the meat in a bowl. Add in the meat and gently incorporate the meat so that everything is well combined, but not over worked. Use hands or fork. Place heaping teaspoons of the mixture, gently rolled into balls, onto a parchment lined baking sheet. Bake for 30 minutes, until cooked through. Set aside. Heat the oil in a large stock pot over medium heat and sauté the onion, chili, garlic, oregano, and cumin until vegetables are soft. Add the stock, tomatoes, chipotle, adobo, carrots and salt. Bring to a boil, then reduce to a simmer for 20 minutes. Add the zucchini and rice and simmer for an additional 30 minutes, until rice is tender. Add in the meatballs and lime juice and heat through. Taste and adjust for seasoning (salt, pepper, more adobo, hot sauce?). Serve hot and garnish with the cilantro and cheese if desired. With Thanksgiving looming, I thought I would help you all out with a list of some easy sides that you can make for next week's festivities. Whether you are having a crowd at your house or want to make something to bring over, these all are delicious and a great dish to accompany your bird. For help on an entire menu that is very easy and you avoid having to make the whole bird, check out last year's post, Thanksgiving for Novices. I hope this is helpful and that you have a fantastic holiday! I have started to really like the whole casserole concept. Anything that can come piping hot out of the oven, be considered a complete meal and be delicious really has a lot going for it. Before I was sold on casseroles, I imagined them all to be dated versions of what grandma used to make and not in a good way. I am relishing in the loveliness of left overs and casseroles can be made and eaten over several days. So if they are really delicious, I love how there is something great waiting for me each day for lunch with minimal effort. This recipe broke another stereotype of mine, that anything off a box or container could not possibly be very good. Wrong again. This super healthful and flavorful recipe was first spotted on the side of my chicken stock carton. It is adapted from Prevention magazine and I highly recommend it. 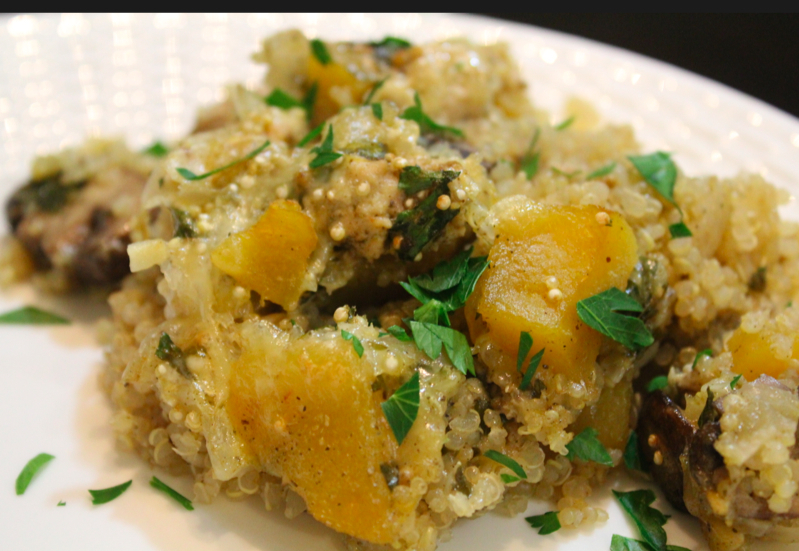 It tastes a lot like Thanksgiving, but without the guilt. Which we will save for actual Thanksgiving. Preheat oven to 350 degrees. In a skillet, saute onion in olive oil on medium high heat for 5 minutes or until translucent. Add mushrooms, squash and garlic and cook for 5 minutes. Add chicken, breaking into small pieced as it browns, about 5 minutes. Add poultry seasoning, salt, pepper, stock and quinoa and bring to a boil. Reduce heat, cover, and simmer ten minutes. Remove from heat. Stir in parsley and 1 cup of the cheese. Transfer ingredients from pan into 9 x 9 casserole dish or baking pan. Sprinkle remaining cheese on top of casserole and bake in the oven for 30 minutes. I am super into one pot meals right now. Call it a crush, it is easy, makes extra for leftovers and always makes a satisfying meal at the end of the day. 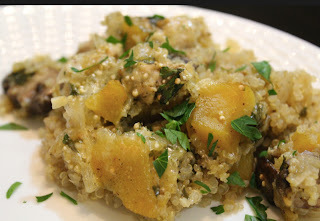 This recipe is a combination of a few that I have read and is easy to make your own from what you have in your fridge. 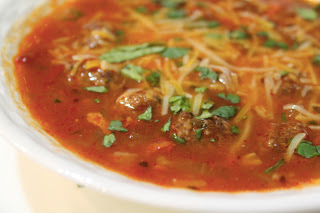 The rich broth that is thickened with cheese is great spiked with spicy jalapenos and your favorite hot sauce. I use either a rotisserie chicken or roast a couple of chicken breasts in the oven (350 degrees, olive oil, salt, pepper, bake until cooked through, about 30 minutes) because I like the flavor. It is also a great way to use extra chicken you might have leftover from another meal. Although this makes a lot, it is addicting. So don't expect quite as much leftover as you may think. In a large dutch oven or pot, add the stock, spices, tomatoes, jalapenos, bell pepper, onion and garlic. Stir to combine and bring to a boil. Salt and pepper to taste, simmer about 30 minutes until tomatoes begin to break down. Add black beans, corn, tomato paste and chicken and stir to incorporate. Add cotija cheese and half the pepper jack and stir to melt. Cook about 20 more minutes until soup has thickened. Add half the cilantro and taste for seasoning. Adjust if needed. Serve in bowls topped with more pepper jack, cilantro and tortilla chips. Everyone looks forward to those familiar Fall flavors that pop up around October and are found in everything from your morning coffee to your mid-week DQ run (or is that just me?). 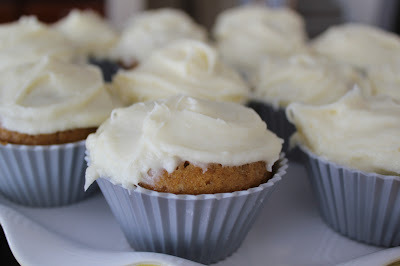 These pumpkin cupcakes are a variation on my favorite pumpkin bread recipe that I shared previously. I make a few batches and send off to friends once a year, then enjoy a couple of loafs myself. I thought I would try making a dessert out of the recipe and the results were delicious. An easy way to upgrade your cupcakes this Fall and add some spice to your dessert options at home. Preheat oven 350 degrees. Line two muffin tins with cupcake molds. Sift dry ingredients in a large bowl. Combine the wet ingredients well in a separate bowl. Fold dry ingredients into the wet, mix until smooth. Pour batter into each mold about three quarters way full. Bake 30 minutes, or until toothpick comes out clean. Remove from oven and set on wire rack to cool. Once able to handle, remove from pan and let cool completely on rack. Meanwhile, beat the cream cheese and butter until smooth. Add the vanilla to combine. Then add the sugar in batches so you will not make a mess. Mix until well combined. Frost each cupcake with a dollop of frosting and serve at room temperature. Can be made the day before, but cover in an air tight container. I am trying to, at least once in awhile, stray from carbs at night when I am feeling extra well fed. Especially after long weekends of lounging and great meals. This Caesar was the perfect way to curb a large, after work appetite and stay on a healthy kick. By adding steak to the salad, you are getting lots of protein and some fat to keep you satisfied. Plus, this punchy lightened-up dressing is a far cry from the globby, calorie laden dressings that you find at most restaurants. It is very lemon-y, so if you do not like things tart, lay off the lemon a bit. But, the tartness is perfect matched with the rich steak. Anyone can put this dinner together in less than 30 minutes and it will not feel like "just a salad." Heat grill or grill pan to medium-high heat. Brush steak with olive oil and season with salt and pepper generously. Grill on each side for 3 minutes for medium-rare, more if you like it more well done. Remove from grill and let rest for 10 minutes. Slice thin. Meanwhile, combine all the ingredients for the dressing, except the cheese, in a blender or food processor. Process to combine well and until smooth. Add the cheese and pulse to combine. Taste and adjust for seasoning. Toss and coat the lettuce with the dressing (you will not use all of it). 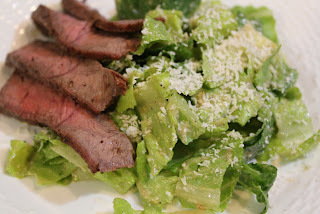 Place the lettuce among the plates, top with slices of steak, sprinkle with grated Parmesan and freshly ground pepper. The comfort of a bowl of rich tomato sauce and pasta is hard to beat. Pasta is hands down my favorite comfort food and a great tomato sauce comes in at a close second. I am always trying new recipes to match the dreamy, thick and luscious sauces in Italy. 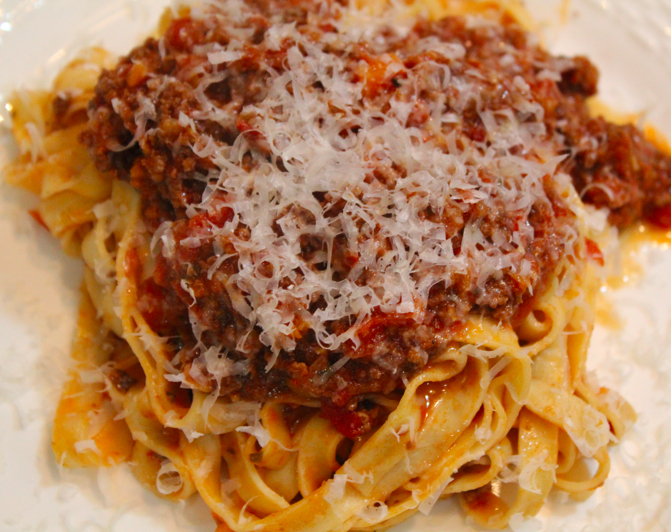 When it gets colder, I especially love a great bolognese and this recipe is hands down the best I have ever made at home. I wish I could take credit for this amazing sauce, but it is from one of my favorite cook books Cristina's Tuscan Table. If you love rustic and authentic Italian, buy this book. As for the sauce, you could eat a bowl of it all on its lonesome with some toasted bread. I chose to serve it over fresh linguine, but you could also use it in a lasagna, or serve over soft polenta. Any of those options will be delicious. In a bowl, marinate the beef and pork in 1 3/4 cups wine and refrigerate at least 3 hours. In a large soup pot, heat the olive oil. Add the minced onion, carrot, celery, garlic, and parsley and saute over medium high heat until onions are soft and translucent, about 10 minutes. Add the marinated meat, pancetta, salt and pepper. Cook uncovered, stirring with a wooden spoon until meat is browned, about 30 minutes. Add remaining 1 1/2 cups wine and stir, scraping the bottom of the pan. Add the bay leaves and tomato paste, and cook 2 more minutes. Stir in the tomato puree and red pepper flakes, and simmer, covered, for 2 hours. Salt and pepper to taste. Everyone needs an easy tomato soup recipe for comforting nights in and easy lunches to go. I knew it was the perfect opportunity to make my basic recipe after I hauled back a large sourdough home from San Francisco. Yep, I was that person. 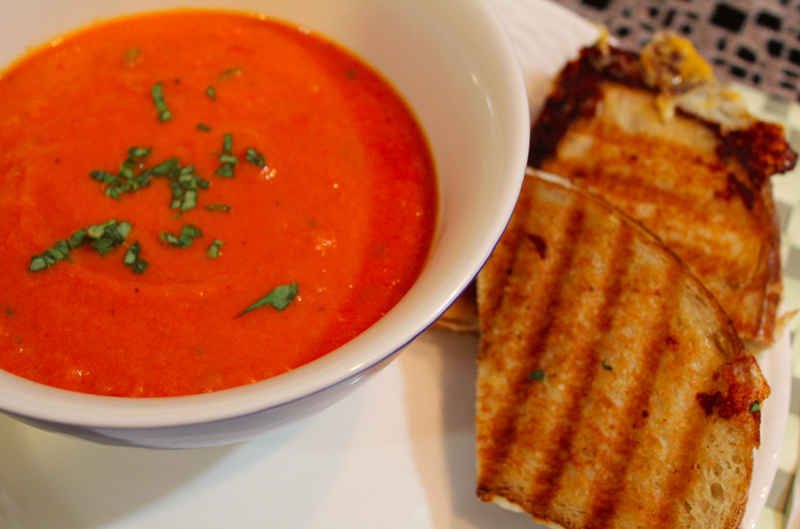 And I am so glad I did because it made amazing grilled cheese to go with my soup. I call this recipe basic as it has no real surprises to it, but that does not take away from how delicious it is. Unlike many tomato soups with heavy cream, I have added half and half. It gives you that hint of creaminess, without all the guilt. A tip for your grilled cheese is to use a panini press, but if you do not have one, a plate and a kettle full of water pressing down on each sandwich will do just as well. I have eaten this meal three times already, my sourdough is almost gone and I know I should have made more tomato soup to freeze. Best thing is, this is so easy to make I might just repeat it tomorrow. Place a large pot on the stove over medium heat. Add the oil and once hot add the onion and carrot. Sprinkle with salt and pepper and sweat until onions are translucent and carrots soften, about 10 minutes. Add the garlic and crushed red pepper, stir and cook for 1 minute. Add in the tomatoes with their juices and the chicken stock. Season with salt and pepper generously and bring to a boil. Turn down heat and simmer for 15 minutes. Turn off heat and allow to cool slightly. If you have an emersion blender, blend soup in the pot. If not, place small amounts of the soup in a blender and puree to desired consistency (I like a little chunky, but go as smooth as you like it). **Be careful not to overfill blender and to let the soup cool a bit. Otherwise you will have tomato soup all over your kitchen, trust me I did it** Return soup back to pot once it has all been pureed. Warm soup up if needed, add in the half and half and 3/4 of the basil. Taste and adjust seasoning. Serve warm with a bit more basil sprinkled on top.